Cooper-Young’s Memphis Made Brewing has released several limited-edition, high-gravity beers in a new format. 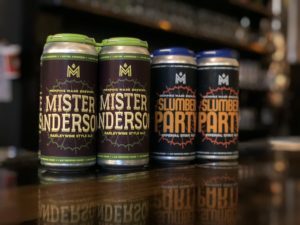 The Midtown brewery has packaged The Kickdown, Slumber Party, and Mr. Anderson in 16-ounce cans and will be releasing four packs of these beers throughout Shelby County. The Kickdown (9.2 percent ABV) is a Belgian Style Tripel inspired by the music of Memphis’ own Snowglobe. Like the band, this beer is spicy, orange-y, adorable, bready, beardy, sweet, dry, and smile inducing. Slumber Party (9 percent ABV). Break out your footie pajamas and discover hidden delights under blankets of dark chocolate and rich caramel. This R-rated stout was our first high gravity release. Don’t be the first to fall asleep and miss out on all the fun. Mr. Anderson (9.2 percent ABV), a “Mid-Atlantic” barley wine, finds the sweet spot between the hoppy American version of the style and its English cousin. Wherever you go, this beer is watching you. Memphis Made started selling six packs of its Fireside beer last year. It plans on releasing more beers in cans this year. Memphis Made Brewing is a production brewery and tap room located at 768 S. Cooper St. Drew Barton and Andy Ashby started the company in October 2013. It self-distributes to more than 200 bars, restaurants, and stores throughout Shelby County. Its Cooper-Young tap room is open to the public Monday, Thursday, Friday 4-10 p.m., Saturday 1-10 p.m., and Sunday 1-7 p.m. For more information, go to www.memphismadebrewing.com.